There aren't many bands that can shock the senses on a cool Tuesday night in December. 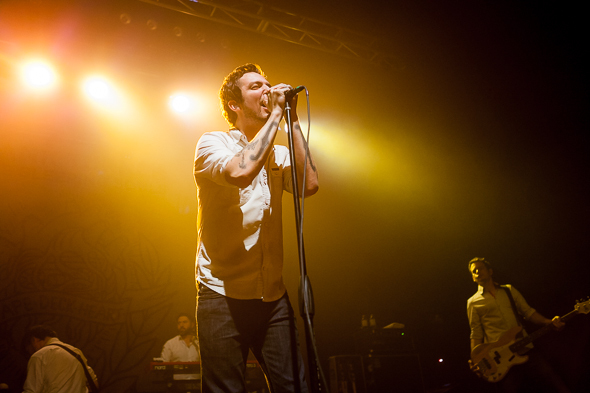 Toronto's formidable July Talk and folk-punk extraordinaire Frank Turner, however, can. And they did just that last night at everyone's favourite Sound Academy. 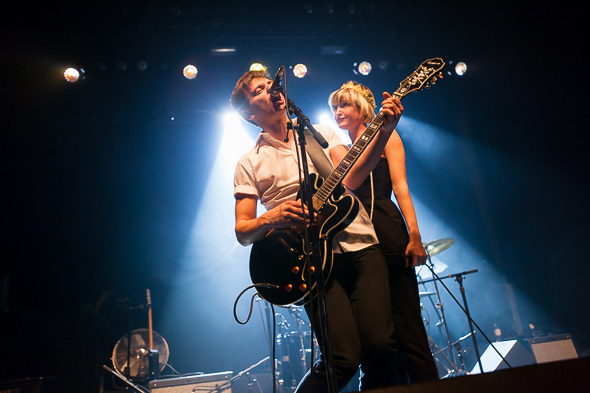 July Talk formed last year. 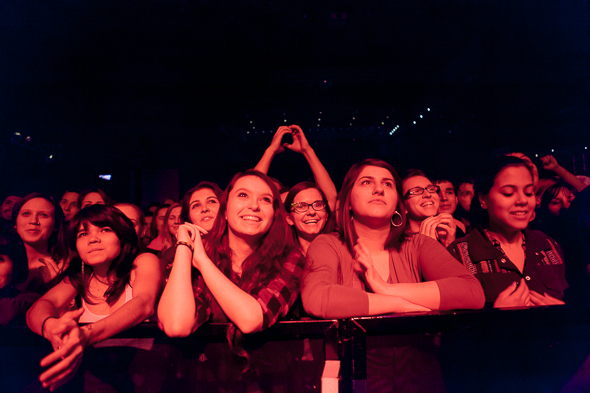 A year later, they are playing at the cavernous Sound Academy to a decently sized crowd that just can't get enough. That doesn't happen to just any Toronto band. And they pulled out all the stops. Frontman Peter Dreimanis with his husky, Tom Waits-esque growl is perfectly complemented by the lady of seduction and wispy-voiced Leah Fay. Their chemistry is palpable. Him with a white button-down, her with a black onesie and pearl necklace. And when they hit the stage together with the rest of the band, everything comes together. Dreimanis' voice holds like gravel on a country sideroad. Fay swirls her pearls, drips with confidence and sings into her high heel. Easily their biggest show to date (they did make a lot of fans this summer playing at Hillside in Guelph), July Talk have quickly become known for their live show. In fact, they're up for a CBC Bucky Award for best live performance. A number of times in between howls and yelps, Dreimanis asked the crowd: "Are we having fun yet?" They seemed genuinely enthused to be giving it all on stage, doing what the could to get the Tuesday night crowd ready for Frank Turner. And I have a feeling it won't be their last big show, as we have it on good authority that there were a couple big labels scouting them last night. (July Talk are currently on the Toronto-based indie label, White Girl Records). Expect big things from July Talk in the near future. And then enter Frank Turner and his fellow Sleeping Souls touring their fifth studio album, Tape Deck Heart. 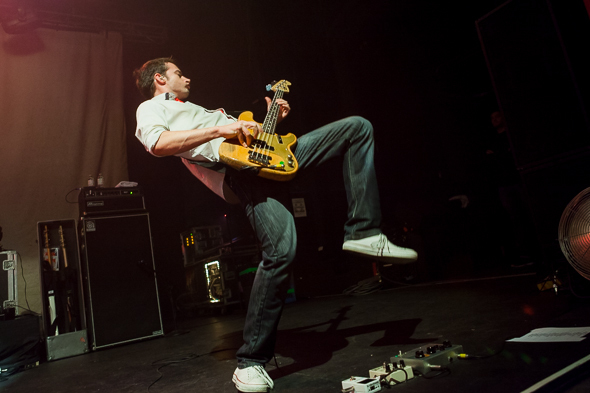 No stranger to Toronto, Frank Turner has played all over this city in recent years -- Horseshoe, El Mocambo, Phoenix and now Sound Academy -- which just shows his skyward trajectory. 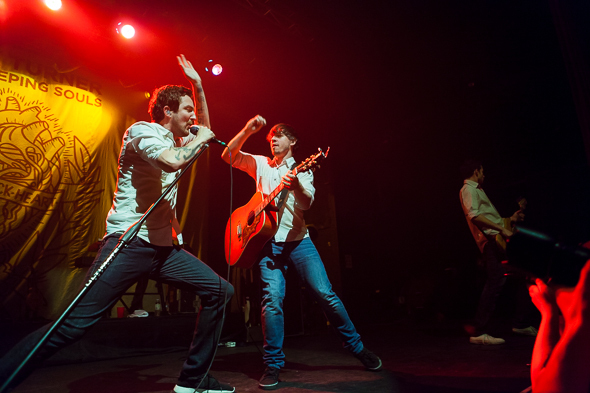 Opening with the sing along-worthy "Photosynthesis," Frank Turner shows why he's a natural performer as the crowd lends its voice to the chorus: "I won't shut up / I won't sit down / And most of all I won't grow up." Being quite chatty in between songs, Turner shares that he recently screwed up his back at a show. His doctor told him he couldn't play his acoustic guitar and had to cancel all of his shows up until Christmas. But this is Frank Turner, a defiant folk-punk troubadour, so he just put on a giant wrap around his back and chest and played as if everything was just fine, gliding around the stage. For anyone that has seen him play live, Frank Turner is one of those performers that gives it all for each show, even if he threw his back out. And his devoted fans were happy to reciprocate, hanging off every lyric as the Englishman brought his variety of rapid fire folk lyrics back to Toronto on cool December night.